Errol Spence Jr. vs. Mikey Garcia HD 2 Blu-Ray Set. 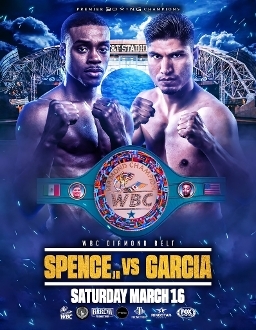 Fight for the IBF/WBC Diamond Welterweight World Championship, held on March 16, 2019 at the AT&T Stadium in Arlington, Texas, USA. Includes David Benavidez vs. J'Leon Love, Luis Nery vs. McJoe Arroyo & Chris Arreola vs. Jean Pierre Augustin. Blu-Ray Set Includes: Fight Camp: Spence Jr vs. Garcia, Face to Face, Live Weigh-In & more. Spence Jr vs. Garcia Full Fight: Pre-fight Hype, Ring Walks, Full Fight. Also: David Benavidez vs. J'Leon Love, Luis Nery vs. McJoe Arroyo & Chris Arreola vs. Jean Pierre Augustin.